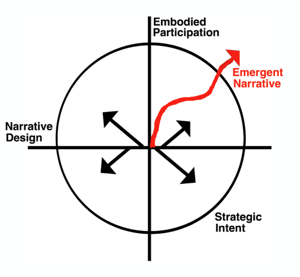 What is Strategic Narrative Embodiment? SNE translates the transformational effect, story shaping and ensemble skills of stage performance into the language of work performance. It functions particularly well as a methodology for mindfulness training, change agility, team development, innovation, leadership development, strategic planning and relationship selling. SNE is based on a model developed in my PhD in 2008 and has, since then, been greatly influenced by trends in organisational and leadership development. These trends include mindfulness and neuroscience, systems thinking and systems coaching, narrative coaching and sense making, gamification, and thanks to Burgert, applied improvisation. For more on the foundations of the model click here. Attempted extrication in spite of the obstacles. What the character wants relates to the strategic intent. The obstacles relate to the embodied reality that make the achievement of that intent difficult and the narrative design relates to the attempt at extrication. The logic is that, if you don’t have what you want yet, the story needs to change. SNE is designed to identify the story that is no longer helpful to the individual or the collective, understand its effects, generate workable alternatives and implement these in the world of work. Along the way it teaches communication skills, relationship building skills, presentation skills and inspires people to change for the good of the organisation and the world. The relationship between the narrative design of the workshop and a participant’s interaction with it through embodiment techniques is represented below. The process is contained by the original strategic intent of the workshop as delineated by the client and informed by organisational value statements. The centrifugal arrows indicate the fracturing of unofficial dominant narratives that are in conflict with official value statements into possibilities and the curved arrow indicate an emergent new narrative. On the level of technique, therefore, we have designed a number of structures based on performance techniques that allow participants to externalise their current narratives abbout a certain issue, play with alternative narratives and come to make choices based on new emergent narratives. Such techniques draw heavily on applied improvisation for their effectiveness since applied improvisation offers people the opportunity to develop creative problem-solving skills, collaboration competencies and confidence under pressure to perform. Strategic Narrative Embodiment (SNE) was developed in South Africa by me, Petro Janse van Vuuren and my brother and erstwhile business partner, Burgert Kirsten, as directors of Playing Mantis Coaching and Facilitation Development (Pty) Ltd.